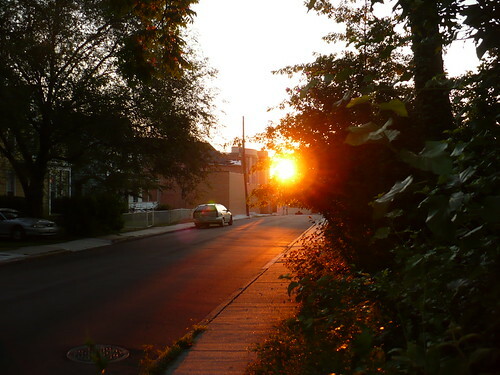 Morning sunrise in July, a photo by rjknits on Flickr. Sometimes, you need a little dose of color to cure the winter blahs. We’ve been having such a mild winter, it seems ridiculous to admit it — but I’m feeling kind of “blah” this month. Maybe I need a snowfilled landscape to feel like I’m living in and through winter (instead of waiting for it to start). If you feel blah or blue about the weather, museums offer little pick-me-ups of color. 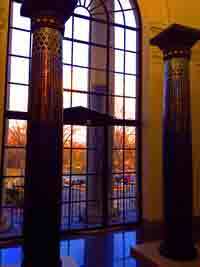 Like Tiffany columns tucked in a corner, glowing like fantastical mixes of Egyptian and Roman art (with a bit of Mardi-gras style thrown in). Lovely. Having a sunny day was lovelier though. Hope your spring blooms are coming up slowly, and you have time to enjoy the seasons changing. I know other parts of North America have been shoveling out. Around here, not so much. It’s just dingy grey a lot of the time.